Recently our lab had the annul lab inspection. I still remember the first time I went through it and it was not a very present experience. One thing I found very interesting was that the inspector wanted us to label the water tank. 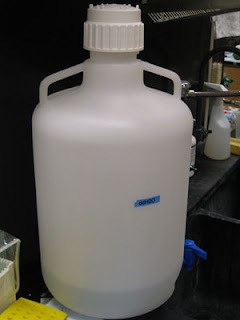 It was very obvious the water tank was only used for water in our lab (we only had one water tank and it is essential in every lab so if you only have one, for sure it contains water), yet the inspector wanted us to label it. I understood the importance of labeling everything in the lab because many solutions are clear and there is no way to tell what the solution is by just looking at it. This incident reminded me of TV programs such as CSI, X-file or any programs that has something to do with labs. If you pay attention, none of the bottle or tubes are labeled in their labs. It is amazing how they can even get results and solve crimes or mysteries.